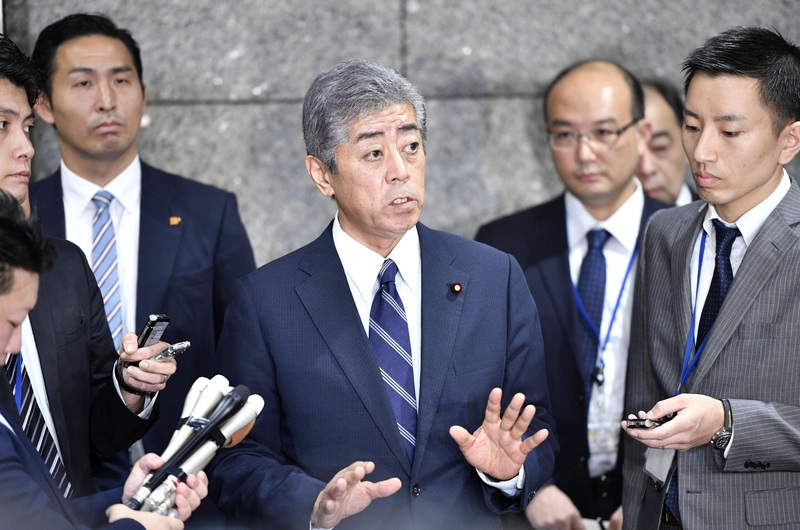 The central government has requested that the land ministry review and invalidate the Okinawa Prefectural Government decision that forced a suspension on relocation work for the controversial U.S. Marine Corps Air Station Futenma. “We still hope to realize an early (base) relocation to the Henoko area and the return of (land occupied by) Futenma Air Station,” Chief Cabinet Secretary Yoshihide Suga told a news conference Wednesday. The landfill work was approved in 2013 by then-Gov. Hirokazu Nakaima, but his successor, Takeshi Onaga, who died in office in August, revoked the approval in 2015. In a court battle that followed, the revocation was found to be illegal and Onaga rescinded it in late 2016. 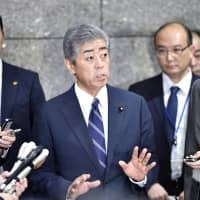 But on Aug. 31, Okinawa Prefecture again retracted the landfill work approval as instructed earlier by Onaga, citing illegality in the relocation work procedure. The base construction has been on hold since. The government is seeking to relocate the U.S. base’s operations from a crowded residential area of Ginowan to the less-populated coastal district of Henoko in Nago based on the Japan-U.S. agreement in 1996. Japan chose Henoko as the replacement site in 1999. Onaga’s successor, Gov. Denny Tamaki, wants the base out of the prefecture, which has long hosted the bulk of the U.S. forces in Japan. Tamaki, who is opposed to the base transfer plan, won the Sept. 30 race, beating a rival backed by Prime Minister Shinzo Abe’s ruling Liberal Democratic Party.